On Sunday, January 21, two teams of District 75 CyberPatriots participated in the State CyberPatriot competition -- a series of tasks identifying cybersecurity vulnerabilities in virtual operating systems. The six hour competition was held at the Innovation Station, located at the Mundelein School District 75 offices. 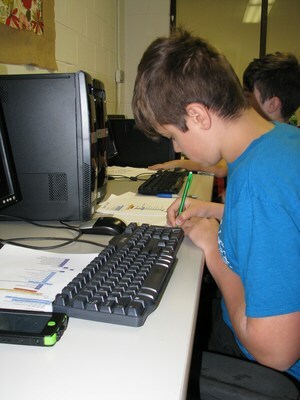 This is the first year students from Carl Sandburg Middle School have participated in a CyberPatriot Team. In their inaugural year, the two D75 teams are ranked 1st and 4th places in the state of Illinois, with the top-scoring team ranking 92nd out of 553 teams nationally. It speaks volumes of the dedication of both the CSMS students and their mentor that they have advanced to such a high level in such a short period of time. "I'm amazed at the progress each of these team members has made in the several months we've been running this program,” says Bill Jarrett, coach of both D75 CyberPatriot teams. “We weren't sure what challenges would be thrown at our teams and there were no experienced senior team members to help the teams prepare. Everyone on these teams spent a lot of time learning the skills needed to harden these operating systems from attack. When we started practicing, some of the students had no idea what part of the computer the monitor was, and although they were savvy web- and computer-users, almost none of the team knew anything about how computers worked. To go from that level to being competitive in only a few short months is an amazing accomplishment and a tribute to the hard work these teams have been putting in." Teams participating in the competition have a window of three days in which to complete the competition challenge. Final scores for the competition will not be available for at least one week after the competition. If the teams are successful, they will advance to semifinals in February. From there, the top three teams in the nation will advance to the national competition in April. CyberPatriot addresses a growing issue of national concern: cybersecurity. Its purposes are four-fold: 1) to engage and inform students about career opportunities in cybersecurity and STEM disciplines, 2) to help students recognize the necessity of cybersecurity, 3) to make students acquainted with cybersecurity principles, and 4) to equip students to better protect themselves on the Internet. Not only are our middle school D75 students gaining exposure to a critical and developing career field, but they are also developing, applying, and synthesizing computer and critical thinking skills to solve real-world cyber challenges.